Drainage work at eastbound 128th St. SW and 4th Ave. W.
Construction crews broke ground this week on the future Swift Green Line station on eastbound 128th St. SW just west of 4th Ave. W.
Most of the week was spent preparing the area for efficient stormwater drainage by installing pipes and underground gravel. The gravel will help the ground absorb stormwater from the roadway. Next week, the site will be graded, utility conduits will be installed, and if weather permits, concrete foundations will be poured. Demolition and grading work will begin on the westbound side of 128th St. and 4th Ave. next week. Northbound, Airport Rd. and 112th St.
Southbound, Airport Rd. and Kasch Park Rd. Southbound, Airport Rd. and 112th St.
All station construction, regardless of location, requires periodic closures of one lane of traffic. Some closures occur during the day (9 a.m. to 2 p.m.) and others occur at night (8 p.m. to 4 a.m.). 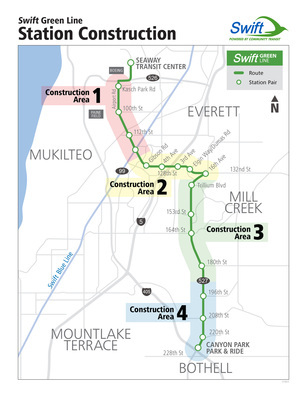 This week at the future Seaway Transit Center, concrete was poured for two seat walls along what will become a pair of Swift Green Line stations. Other work included installing several concrete light pole foundations, which will take another week to complete. Other work next week will include digging along 75th St. for the foundations of three more traffic poles. Traffic on 75th St. will be reduced to one lane in each direction as needed between 7:30 a.m. and 5 p.m. 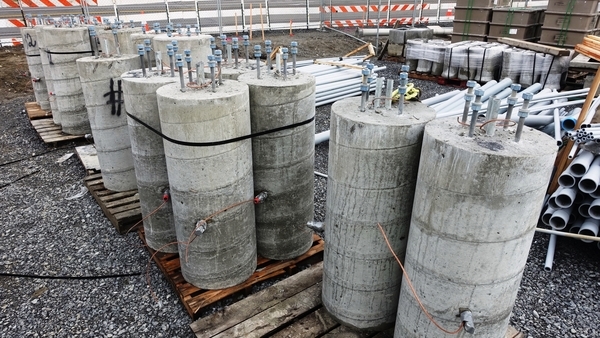 These concrete cylinders are foundations for light poles, cast with electrical conduits already inside. 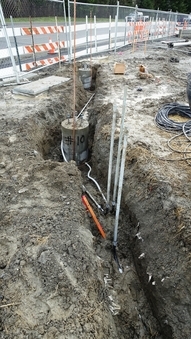 They are connected to underground electrical conduits; when they’re buried, the tops of the cylinders are exposed and ready for the light poles to be attached. The sidewalk and part of the driveway of the Quality Inn & Suites that were dismantled during construction the past few weeks are now complete. Utility companies are working in the area of the driveway, so the driveway will be completed once they finish. 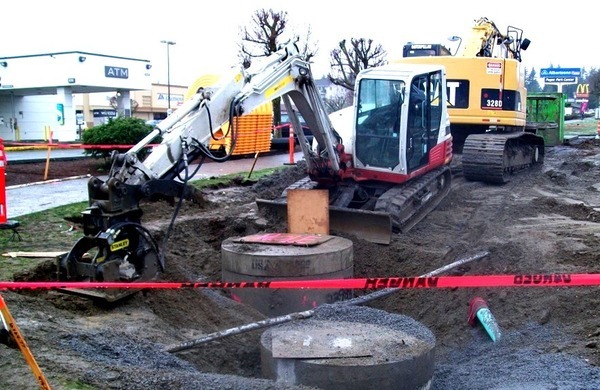 Drainage work, including the installation of a rain garden, continues on the corner of 128th St. and 3rd Ave. SE. New traffic poles and lane signage are scheduled to be installed in the next 3-5 weeks. Final landscaping will be completed at this time.